Earlier this year, HSF reconnected with Mr. Tom Cartlidge, the driving force behind the Olsen-Stelzer Boot Company. Mr. Cartlidge is a Vietnam veteran and custom boot maker who, for the past several years, has given back to fellow veterans by crafting custom made cowboy boots for military amputees and other wounded warriors. As you may recall, we worked with Mr. Cartlidge to design custom crafted boots for Staff Sergeant Johnnie Yellock II, U.S. Air Force (Retired). Through our conversations with Mr. Cartlidge, we identified a project to design boots for an incredible veteran named Rob Jones. During his junior year at Virginia Tech, Rob joined the U.S. Marine Corps Reserve as a combat engineer at Bravo Company, 4th Combat Engineer Battalion in Roanoke, VA. Rob deployed to Habbaniyah, Iraq in 2008 and then to Afghanistan in 2010. It was in Afghanistan while operating as a part of a push into Taliban territory, that Rob was wounded in action by a land mine. The blast resulted in a left knee dis-articulation and a right above knee amputation of his legs. The initial phases of Rob’s recovery took place at the National Naval Medical Center in Bethesda, MD. He was then transferred to Walter Reed Army Medical Center for the remainder of his rehabilitation. It was during this time that Rob relearned how to do things like walk, run, ride a bike, and row. Rob really took to rowing and decided to train for the 2012 Paralympics, where he and his teammate brought home a bronze medal. 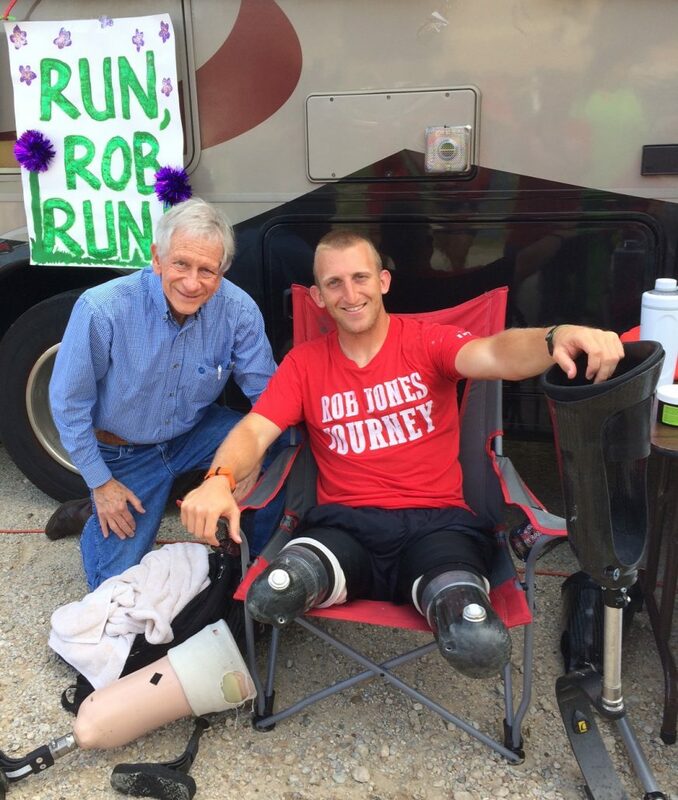 Rob continued to seek new challenges and in 2013 completed a 181-day bike ride across United States, from Bar Harbor, Maine to Camp Pendleton, California raising money for charities which aid wounded veterans. In the fall of 2017, Rob accomplished his goal to run 31 marathons in 31 days in 31 different cities. 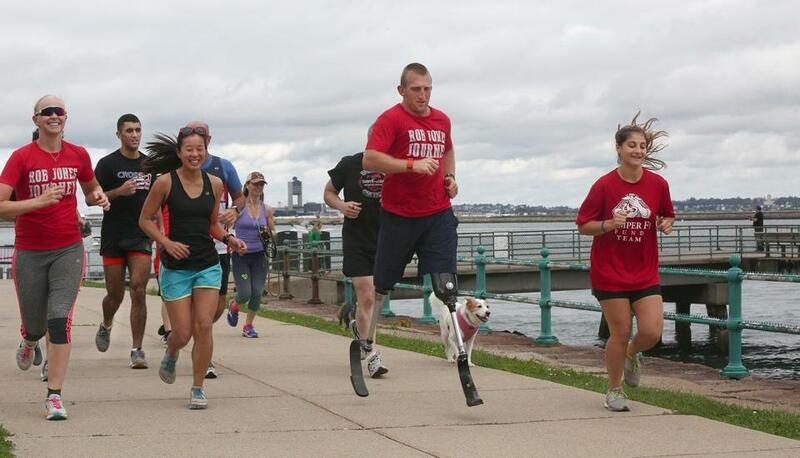 With the support of a great team, Rob raised over $200,000 for the Coalition to Salute America’s Heroes, the Injured Marine Semper Fi Fund, and the Stephen Siller Tunnel to Towers Foundation. 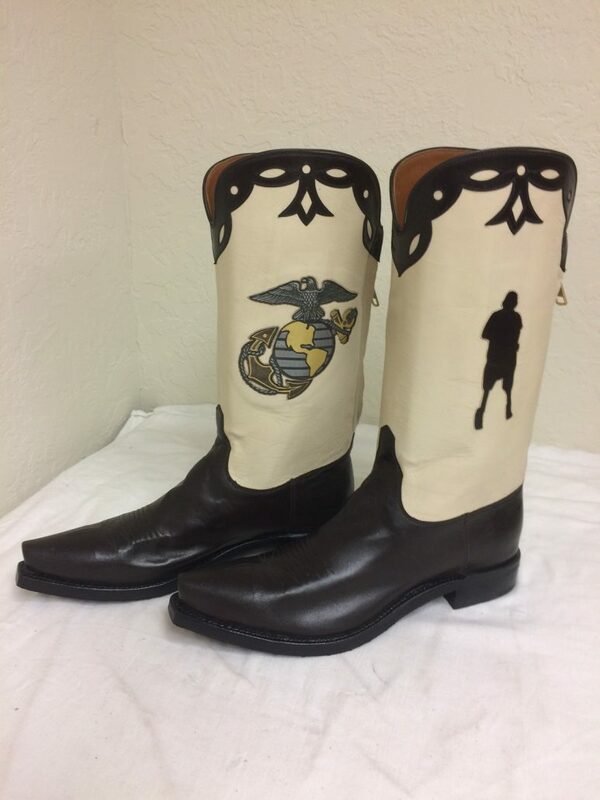 Rob’s custom boots feature a silhouette of Rob running, along with the U.S. Marine Corps eagle, globe, and anchor emblem. 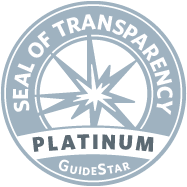 It was our honor to work with Tom and Rob on this special project. Rob’s service and selflessness inspires us to provide targeted support to those facing a life-threatening illness or recovering from traumatic injuries.